The light,airy fibre workshop with its mezzanine is now completed and ready for the open day. These pictures give some idea of the scale inside the workshop. In just a few weeks we have something resembling a building. There will be two rooms, a fibre workshop and a guest room each with its own entrance. We have at last received planning permission to build a fibre studio/workshop on the site of an existing cattery building. This is the cattery after the units have been removed. Made with a long strip of white felted fibre from Ambrosia, with a smattering of black from Moira, the whole piece dyed green and sewn around a wire frame. 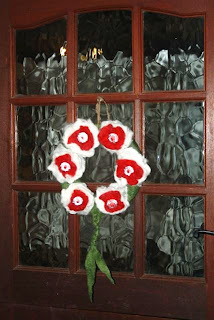 Eighteen white felted discs from Ambrosia and six red merino discs fashioned into Christmas flowers with large crystals for centres. Three strips of the green trimmings plaited together at the bottom and a length of spun Pela to attach to the front door! et voila. No! Not me, I had a shower this morning. The middle of Ambrosia’s fleece is so dirty that the carded stuff tooks positively brown. If I spin it like that it will be impossible to get the grime out of the twist but I have had problems washing fine baby alpaca before. I decided to try one batt, call it the sacrificial batt if you like. I filled the sink with tepid water with a very small dash of hand wash liquid, as I pressed it under the water I caught a wiff of the first rain after a long hot spell in the summer (quite evocative). The water instantly turned brown so I swished it about a bit then fished it out, it looked like a sheet of fine felt. I rinsed it anyway and carefully stretched it out onto a towel were it could be rolled up and wrung out. Lo and behold, when I unrolled the towel I had a fluffy white batt ready for drying and spinning. So I have now washed six batts and can’t wait to get spinning. It’s been 6 months since my last blog, I just got carried away with the lovely warm summer days and light evenings and didn’t think about sitting in front of the keyboard, definately an outdoor person at heart. I have had lots of time to practice my spinning technique and am doing quite nicely thank you. Photographs were taken by our in-house professional photographer as usual. I might be achieving on the spinning front but I know my limits and cameras are strictly off limits. Hats, scarves and wrist warmers have been flying off knitter sister’s needles at a fearsome speed. She knits a mean cable stitch and the neck warmer/scarves are absolutely gorgeous. enough to cover the cost of shearing at any rate. We had a new addition to the herd, Pela gave birth to a lovely chocolate brown cria so I can’t wait to get my hands on her beautiful fleece. I have started experimenting with acid dyes, the ones that are set in the microwave, ready in 8 minutes! This photo was actually taken by me so just ignore the clutter in the background. This was supposed to be marine blue but because alpaca fibres are hollow, there is less density of colour, something to take into consideration in the future. It has been quite a rush this past few weeks. The girls are due to be shorn in two weeks so I had to process last year’s fleeces. All of Pela’s fleece is now turned into batts awaiting the big spinning session. Ambrosia’s 5 week old fleece is too short to spin but it is so soft and curly I just had to card it. I now have 5 batts of something like white lint. I have done a trial felting using merino as a middle layer to provide structure with the “baby lint ” on either side…more on that another time. I have had a go at making felt buttons, starting with a long thin ‘worm’ layers of fleece are wrapped around until you have what looks like a hairy fat cucumber. This is rolled and battered until it felts. The cucumber is sliced up to reveal the layers! I think these ones look like fish eyes! It’s been a while since my last blog, this has a lot to do with the vegetable plot and poly tunnel. Most crops are in now, I just need a bit more rain to get things going. Knitter sister came down from Greenock with the latest knits from Minnie and Moira’s fleece. First this goegeous little girls cardigan, its incredibly warm and soft. Then another hat, this one smaller than the last. And finally a pair of wrist warmers with a dashing cable down the back and Moira’s beautifully soft black fibre trimming around the hand. 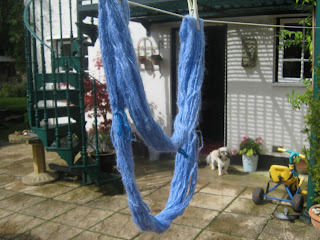 We had a great weekend and I taught knitter Sister the rudiments of spinning and felting. She produced her own ball of wool from the bats prepared at the last blog and we created this little bag using jacobs sheep wool, decorated with alpaca and merino.